Something new and rather good has happened at Rang Hill on the north side of Phuket Town. A new viewpoint has been built! Maybe not a huge deal, since Rang Hill has always had a decent view, but it's been done very nicely and with a platform extending out to the south of the hill beyond the tree cover, so the view is now much better and you can see pretty much all of Phuket Town, plus all the way across to Chalong Bay and the hills to the west including the Big Buddha. 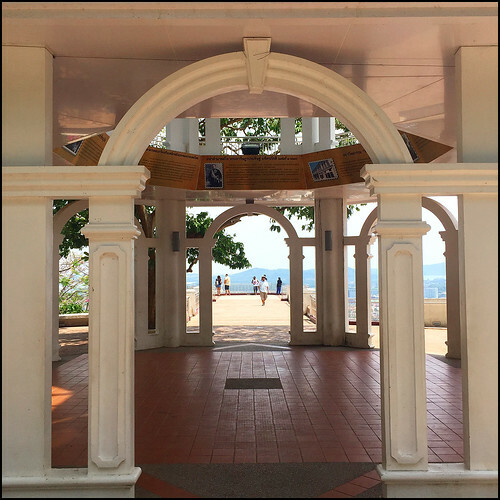 We've been up Rang Hill countless times and it's been blogged several times, most recently in 2013 (see Rang Hill in Phuket Town). Not much had changed up there for many years. A twisty road heading up from town (actually several twisty roads from different directions) and the well known Tunk Ka Cafe which has been there for .. well, it's been there longer than I've been in Phuket. A new restaurant called Khao Rang Breeze was completed a few years ago (we've not eaten here) and now there are more monkeys than there used to be. Nice! You walk under a white pavilion to reach this open area. When we saw the building going on we thought the pavilion would be like a view tower, but there's no steps to take you up to the upper levels, although it does have a balcony and looks totally like something to be ascended. Someone mix up the building plans somewhere? (above) Tower / Pavilion at the Rang Hill Viewpoint. Rang Hill is not exactly a tourist attraction. But it's easy to find and with the nice views and places to eat, worth a look if you are exploring around Phuket Town. We stopped at the weekend to check out the new viewpoint and it was all local people up there. And as my daughter noticed, most of them were taking selfies. It's well built and certainly adds to Rang Hill. We did not stop for food on this particular day. We have eaten at Tunk Ka Cafe many times and we also meant to try the Rang Hill View restaurant which is half way up the hill, but seems to have closed down now. The Breeze restaurant is a little pricier. 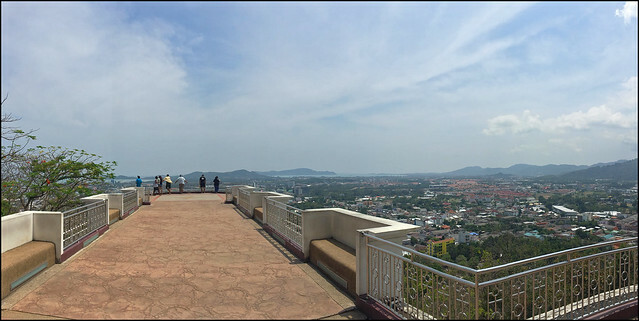 Previously, the view from Rang Hill was more limited looking southwest towards Chalong and the Big Buddha. There were snatches of views to the south from Tunk Ka, looking through the trees, but now with this viewing platform you get a view spanning more than 180 degrees and I think it looks great. (above) View from Rang Hill. You can see a full size version here - click on it! It was just about possible to see Phi Phi in the distance (nearly 50km away to the southeast). 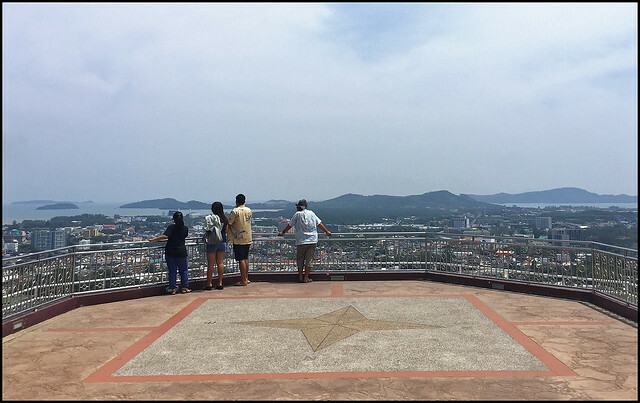 Most of Phuket Town is visible, you can see south to Cape Panwa, southwest to Chalong and (visible on the right side of the top photo of the viewpoint) west to the hills including the Big Buddha and Radar Hill. Now I need to visit again around sunset time! I think this viewpoint has been done really well. Good job, Phuket municipality! 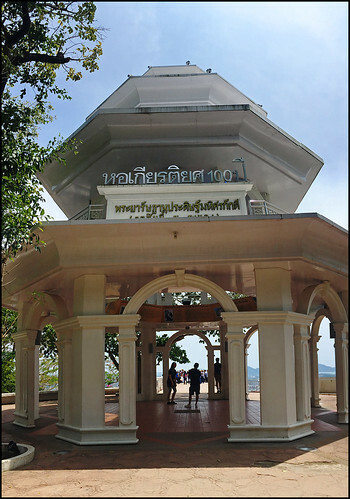 We were just in Hua Hin last month and they have built several viewpoints on top of the hill (Khao Hin Lek Fai) to the west of the town. This viewpoint at Rang Hill certainly rivals Hua Hin. I'll try to get up again sometime for a sunset. Photos on this page taken in 2014 and 2017.